If you observe actor Olivia Munn (X-Men: Apocalypse, Iron Man 2) and her mum, Kim Schmid, for even a moment, you’ll see that they have a special bond. They joke often and laugh easily. “My mother and all of her uniqueness has definitely shaped who I am today,” says Munn. Much of their bond developed over home-cooked meals made by Schmid, a refugee from the Vietnam War. Recently, Munn surprised her 155-centimetre-tall mum with an overhaul of her Oklahoma City kitchen to make it easier for her to use. Now she can cook large family meals without the need for a step stool. I love the kitchen. I'm 1/8'' away from being 5' tall so I would absolutely appreciate a kitchen similar to this one! I think the decor and entire design is probably my favorite so far. This is beautiful all the way. And im not just saying it cause Im 4’ 11” . Love everything! How wonderful! I too am on the short side. We have a kitchen cabinet that stores the flour, sugar, baking soda, well you get it. All the things you need to use in baking in a place that is to high for me to reach without a stool or climbing on the counter. Yes I know the common sense thing would be to move them. I moved in with him and his kitchen was all ready set up this way. He does not like things moved around. 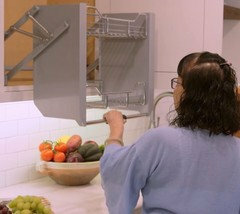 So I can really appreciate what she did to make the kitchen more accessible for her mom. When we redo ours the baking cabinet is getting relocated. Beautiful renovation. Glad her mom’s height was taken into consideration. Great results. Opening up the ceiling made a huge difference. I hope her family enjoys this for many years to come. Wow!!! What a transformation. What an AMAZING gift to her mother. Very heartwarming. Such a beautiful space for an a charming lady. Good job Olivia and team. So sweet. Incredible work Travis the renovation is beautiful!! I wonder if that Green Bay Packers clock on the wall next to the front door will stay . . .
Super sweet Dad and so nice of OM to show her Mom the love! Gorgeous kitchen and beautiful family. Loved Olivia in the Newsroom. Ms Olivia is quite a character, just like her mom. :) Travis did such fantastic designs and incorporation amazing ideas for Mrs. Kim. Mrs. Kim needs some more pull-downs for the pantry and not just the kitch! :) I enjoyed watching the cultures from 'Nam/Asian to American intermix. Congratulations to Houzz on another nice redo and to Ashton Kutcher for directing and producing this series. What work! Beautiful renovation for your mom. How special! Olivia, what a wonderful gift for your mom. I love your choice in designs and the designer you chose. It is all awesome. Your mom is so cute. I laughed and cried while watching the video. Bless your sweet heart!!! Nancy. Loved this entire story. Good functionality! Where can I get that pull-down shelving system in her kitchen cabinets ? I'm only 4'11" and have lots of wasted space in my cabinets because I don't use the upper shelves. I just don't want to be climbing constantly to reach things, so I only use the shelves I can reach. With a small kitchen, that's a problem. Would love to find out more about that system, and where I can get it. Thanks !! Check Rev-A-Shelve for the pull down shelves. What a thoughtful gift! Useful storage is key; often it is difficult to reach items. How fortunate to have such an appreciative daughter. i love the kitchen ideas.. very convenient also for my height. Loved watching this video !! This is a beautiful remodel; the entire space is bright but at the same time a soft light. Great flooring and a terrific range hood, too. Ms. Schmid's petite stature reminds me of a decade ago when I was a personal chef. A client, who was 4'11", had a beautiful, fully loaded kitchen that had custom everything, including countertops made for her height. I am 5'11" and clearly recall kneeling on the floor to wash pots and pans in the sink. The nanny and housekeeper thought this was the funniest thing in the world, and I went home with a raging backache. However, when I had remodeled my own kitchen a few years earlier, I had the counters raised 3" above standard size, so I could fully relate to how much a difference it makes! The whole concept was so well thought out - spacious and light. I loved the raised ceiling, and the way they used the dead space in the living room to create a pantry. Though I did think the pantry space was a bit cramped and didn't look very finished - bare chipboard shelves by the looks. The warm and expressive people in this story made it really special! Does anyone have information on the flooring? Type/colour etc? Thanks! fabulous multifunctional room. lovely think to do for Mum. What a lovely thought, to make your Mum’s favorite place to be beautiful! There is such joy in giving! It looks gorgeous! Even as a 'tall' person I appreciate the design elements and what makes this kitchen so beautiful. People put a lot of thought into practicality and customisation, those are very important. I wasn 't worried about the walk-in pantry being small as it still offered plenty of space, but the raw particle board shelves? That is not what I wd choose for food storage. Curious if the refrigerator sits behind the island, if so how much distance between the stool & fridge doors? Lots of ideas for short cooks! That is just an Amazing fantastic story and your mother is just simply too adorable!! You're an awesome daughter I love the new look it came out just like you wanted. You guys enjoy and make everyday count! Such a sweet video. And how awesome to see the prints of "Pinkie" and "Blue Boy" in the entryway (8 minutes in)! I grew up loving them during frequent visits to my Aunt and Uncle's home. Great job Olivia. You're a very special daughter! What a heartwarming story to watch this Mother’s Day, and what daughter wouldn’t love to honor the cherished memories of food and family by making it lovely to create more! Beautiful kitchen and renovation! It certainly made the space so much bigger. I love how the white kitchen added to openness. And of course a daughter’s love for her mom shined through! Wonderful Story! I love my mom too and a kitchen remodel is an amazing gift/dream. So many wonderful ideas to make the kitchen more functional. I am definitely going to look for the cabinet pull downs. Thanks for sharing this lovely story. Beautiful design! Could you please share the spec information on the built-in rice cooker? Love it! What a wonderful transformation! Nice to see how they incorporated her personal items into the new space. Amazing transformation, beautifully well done. How sweet! Family is everything!!!!! @Phuong Riedy, I thought that was a showstopper, too. I would like to hear from someone who has a built-in steamer like that. How’s the functionality? Are they easy to clean? What about generating all that steam with no vent to capture it? That would be a problem in my kitchen. How beautiful. How I would love to do something like this for my Mom. God bless Olivia for doing this. Absolutely stunning. I love the pendant lights, any idea where they are from ? I love this make-over. It's so thoughtful and practical, as well as beautiful! Thanks for sharing. Asian steams are becoming popular for those who don't want to go for the steamer oven route. You are getting into needing pounds of food to be steamed, not a cup or two. Gaggeneau, Wolf and Miele as well as commercial brand varieties. They are generally around 12" - 15" built in steamer modules with roughly 2700 heating watts (electric). You will need a heavy duty ventilation system. Most are built in next to the cook top and/or grill sharing the overhead hood & vent system. Expect the one unit to set you back around $2500 on up. They can be used for rice as well as fish and veggies or anything you want to steam as a built-in. More popular is the combi steam/convection ovens which have more uses and are popular in commercial food services. These are replacing the pressure steamers of old. If one doesn't want to go into the built-in route, you can always get a counter top version which is smaller which doesn't need poundage of foods to steam but smaller portions and are a lot less expensive as they are built for the homeowners. One that is very popular today is called Instant Pot for about $100. It is a pressure cooker which is does steam cooking. I loved this houzz story! You know its good when it makes you cry. Loved her in that movie with SJP and now again Olivia makes me laugh. She's magic. Her mom must be so happy! Thank You for making my day. Very touching and beautiful story of a very down to earth daughter and her family. Olivia, her mom, and step-father are delightful. Love the three art pieces hanging on the wall by the dining table. Would you share where I can purchase them? Where do I get the adjustable cabinet shelf? I’m short too! It does take some of the cabinet space away though. Great story! Great make over! Lovely family! All that talk about food, now I’m hungry! @marjas17 asked "Curious if the refrigerator sits behind the island, if so how much distance between the stool & fridge doors?" There is approx 48" between the fridge and the stools. I would say that is a minimum and would have liked to have closer to 60" but it was determined that the space on the other side of the kitchen (between the island and the sink wall) would be a major kitchen traffic zone and needed to be 48" as well. Our general rule is 42"+ between cabinetry in a kitchen. @JodieCameron asked "Does anyone have information on the flooring? Type/colour etc? Thanks!" This is Avant Garde Taupe from Classic Tile in OKC. It is a hardwood look porcelain tile. Very heart warming. Your Mom is sooo cute! Smart too! An awesome Mother’s Day video. Olivia's Mum is adorable & hilarious! I hope she loves her new kitchen! An absolute treat for moms! I can relate to this renovation since I'm short, too. I've seen those cabinets that pull down and they're the perfect solution for us height-challenged people! Good job, good daughter! Such a charming video. Travis had wonderful ideas that worked so well in the space! This is a very special gift from a loving daughter. Very touching story and beautiful renovation. I love what they did to the ceiling and all the innovative ways to customize for Kim’s height and love of cooking. Nice job! I am 5' 12'' but that renovation is really cool for someone shorter! I LOVED this video. My mom passed last year but I would have enjoyed doing this for her. Cherish mom's no matter how far you've grown apart. Find them. Appreciate them. LOVE THEM! Great video. Link or name of the dinning room chairs please! Beautiful renovation! Wonderful story of women bonding creatively! Beautiful! Thank you. What a fabulous way of showing love. Excellent design!! Wow, I love how the space was totally transformed into a beautiful kitchen, great room area that was tailored to Kim’s needs! Great design Travis!